Get your own Digital Mail Box to view and manage your postal mail and packages, 24/7 from anywhere, with our smartphone app or online! 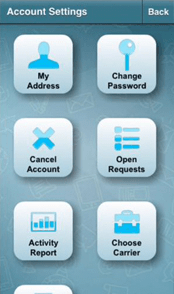 Choose the Digital Mailbox Plan that is best for you! With Digital Mailbox for Me or My Family. Starting at $9.99/month. With Digital Mailbox for My Business. Starting at $9.99/month. With Digital Mailbox Plus Phone and Fax. Starting at $39.99/month. Choose a Location and Plan. Choose an address from 700 digital mailbox locations across the U.S. and abroad. Then select the plan that's best for you, depending on how much mail you expect to receive. Redirect Your Mail. To receive mail at your new address, file a Change of Address form with the USPS and/or notify senders directly. 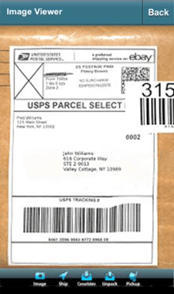 Receive Mail & Packages from Any Carrier. Because every iPostal1 digital mailbox address is a real street address, you can receive mail and packages not only from the USPS, but also from FedEx, UPS and other carriers. View and Manage Your Mail from Anywhere. Use our free app or any computer to view an image of the outside of each mail item you receive. With a click or tap, tell your mail center what you want to do with each item, or schedule a pickup. Add Locations with Just a Click. It’s fast and easy to add additional address locations for business or personal use. Manage mail for all locations from one login. You can forward mail and packages to any address, on demand. See real-time shipping prices. Choose the carrier and level of service that best meets your needs. Save up to 80% on international shipping from the U.S. with locations listed on our International Shipping Locations page. View a PDF of mail content in just a few hours. 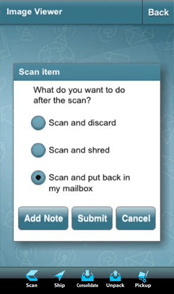 Store scanned mail in the cloud with iPostal1 or download to your device. Get 2 GB of free cloud storage. Discard unwanted mail. Eliminate mail clutter with just a click. If you bank accepts deposits by mail, we can do it for you, no matter where you are. If you live or work near your mail center, you can schedule a pickup during business hours. All our digital mailbox addresses are real street addresses, not PO boxes. Perfect for entrepreneurs or solo-professionals working from home who want to upgrade their business image, register their company, or protect their privacy. Add toll-free or local phone and fax for a complete Virtual Office presence. View and manage your mail and packages no matter where you are, with our app or from your computer. Fast and easy to add locations to extend your company presence to other markets with just a click. Convenience. View and manage your mail from anywhere, 24/7, with an app or from any computer. Save time and money. 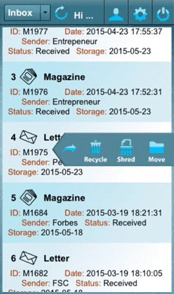 Forward mail and packages to any address, request a scan of mail content, discard or shred unwanted mail. Value. For as little as $9.99 a month you can have your own virtual mailing address for business or personal use with your private Digital Mailbox to view and manage your mail. Over 700 Addresses. Choose from 700 digital mailbox locations across the U.S. or abroad, including addresses at executive business centers in professional office buildings. Real Street Addresses. All locations are real street addresses, not a PO Box. That means you can receive packages from any carrier or use your address to register your business, upgrade your company image, or protect your privacy. Customer Support. When you have a question, just call or email us. Our Customer Service team at our home office in New York is ready to help. Real-Time Shipping Prices. No surprises. See exactly what it will cost to ship your mail or packages. Select the carrier and level of service that best fits your needs and your budget. Plans with Phone and Fax. 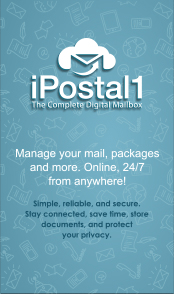 Only iPostal1 offers Digital Mailbox plans with phone and fax, so you can manage everything in one place. Add Locations with Just a Click. Easy and fast to add additional locations. Manage mail for all locations from one login. Select the Digital Mailbox Plan that is best for you!